First of all, a big thank you! So, celebration time again, my dears! Surprise: this is my 100th post! Happy birthday to Sweet Fancy Treat! Yaaay! I've really come a long way since the begining of this blog. In time, it turned out to be my everyday mirror, and it's fun to be able to look back and rediscover things. Wow, there where some pretty intense months. Each day has it's own record, well placed in the Archive. It's all about what I have come across everyday, small inspiration pieces, beautiful pictures, links, street style, interesting people, funky outfits, beautiful thinking. Also, here I've found an amazing blogging community which I'd like to thank for all their support, constructive comments, link exchanges. So, I'm extremely happy to be able to share with you my musings on anything that crosses my mind. I'm constantly working on improving content, adding new columns and writing articles on different subjects. Thanks so much for your support: lots of love and sweet holidays to you all! I've never believed that making a wish when the clock strikes the hour has such incredible powers! And I'm honestly telling you this: there's nothing as powerful as that midnight wish. It gives you energy for a whole year. You may not feel it, but it's the one thing that powers you up! So, remember: the New Year's wish always comes true. Think about the new year as a blank sheet of paper waiting for you to fill it with the most beautiful thoughts, wishes, actions, hope! I'm sure 2008 will be a fantastic year, I can't wait for it to start! So, reinvent yourself: tidy your room, rearrange furniture, adopt a plant and watch it grow day by day. Take up new challenges, get new pictures whenever you have the chance, make collages, involve in DIY activities! I'm wishing you the best luck in anything you decide to do! As for me, I'm taking a short vacantion to celebrate the end of the year, so there will be no posts for a few days. But don't worry, I'm coming back with more ;) What I can tell you though, is that I'm preparing some surprises for this blog. A new year means change and improvement. Ideas and suggestions are more than welcomed. See you soon! 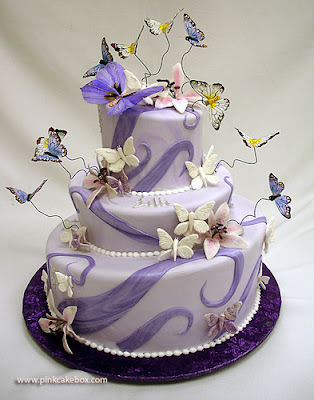 The cake looks almost too beautiful to eat! I'm wishing you a Happy New Year and am looking forward to your future posts! P.S. Thanks for the link exchange!